IN THE LOOP (2009) | ATTACK OF THE RED ENVELOPES! 10 downing street, 2009, anna chlumsky, armando iannucci, based on TV series, chris addison, Comedy, england, ensemble cast, gina mcgee, in the loop, james gandolfini, london, middle east, mimi kennedy, new york, new york city, office politics, paul higgins, peter capaldi, political satire, political underlings, politicians, tom hollander, united nations, War, washington d.c.
A mid-level British politician named Simon Foster (Tom Hollander) unwittingly states invasion of the Middle East is “unforeseeable” on an interview program, and it’s up to the staff at 10 Downing Street to clean it up in order to preserve Britain’s alliance with the Unites States, no matter the cost. And with that note, we are suddenly thrown In the Loop. In the Loop is a political farce of the most creative kind. 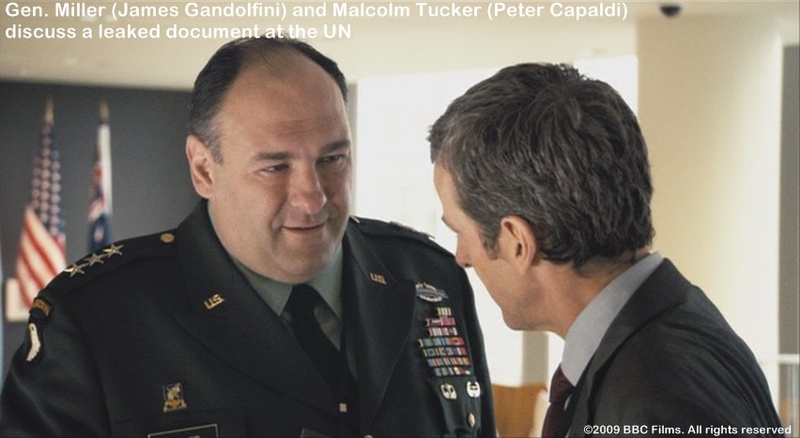 This movie follows the British Prime Minister’s Director of Communications, Malcolm Tucker (Peter Capaldi) as he manipulates, bargains and swears his way from London to Washington and back, and then to the United Nations, in order to make sure that his boss, the Prime Minister, is on the same page as the President of the United States. This movie moves at breakneck speeds. The plot is so heavily interwoven and complex, it actually makes sense. One moment, Foster’s assistant (Chris Addison) unintentionally spills the beans of a secret meeting in Washington to a friend at CNN. Before you know it, half of London is on a witch hunt, looking for the source of leaked documents written by a Washington staffer (Anna Chlumsky). Let me take a moment to talk about Anna Chlumsky. I am very happy to see she is still acting. For those who wonder where they may have seen her before, or perhaps where they’d heard the name, she is a former child star, most notably of the two My Girl movies in the early 1990s. Well, Anna is all grown up now, and in this movie, she has the mouth to prove it! In fact, the insults fly fast and furious throughout the movie. Every principal cast member (even David Rasche’s clean-mouthed Linton Barwick) throws barbs, insults, and profanities faster than a Jonathan Broxton fastball, one right after the other. And this movie is laced with so many “F-bombs”, it might give Goodfellas a run for its money! But the humor in this movie comes from not just the insults. Many situational bits play into the genius of this comedy, as well. There is one particularly funny scene, in which Lt. Gen. George Miller (James Gandolfini) and Diplomacy Undersecretary Karen Clark (Mimi Kennedy) discuss possible troop deployment figures in a girl’s bedroom. It is juxtapositions like this that give commentary to the ridiculousness of the political arena on both sides of the Pond, and director Armando Iannucci captures them with a skilled eye that was evidently influenced by the late Robert Altman. While watching In the Loop, I began to draw similarities with the Kubrick classic Dr. Strangelove. Afterward, when I delved into the Special Features on the DVD, I heard the announcer in the TV spot mention the “instant comparisons” between the two (as quoted by the New York Times). And to tell the truth, I did find myself thinking this movie somewhat reminded me of the Kubrick classic while I was watching it (and before viewing the Special Features). Whether this movie will go down as one of the greatest political farces of all time remains to be seen, but In the Loop has a superb cast, deft direction, a well-played (and Oscar-nominated) script, and some very skillful editing. One word of caution: As a British film, the comedy can be quite dry. This film is not for the uninitiated, but it is obscenely fun to watch.